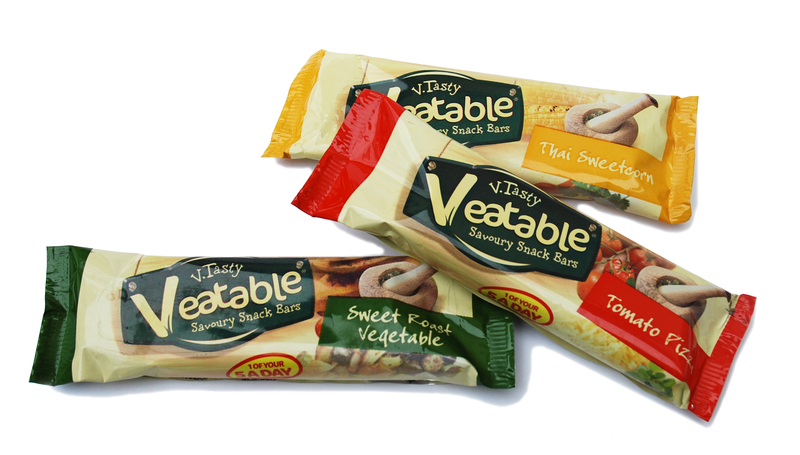 We’ve just found out about Veatable bars, we’ve never come across anything like them before. They’re chewy, baked savoury bars made with diced and roasted vegetables. Now when those mid-morning munchies kick in don’t reach for your usual sweet fix, here’s a savoury alternative to tide you over until lunch. And when the kids want a treat, these snack bars are healthier than a packet of crisps and more exciting than an apple. Not only do they taste good, but by golly they do you good, too. Just 99 calories a bar, 100% natural, gluten and wheat free, they’re suitable for vegetarians and they count as one of your five-a-day. Naturally they’re free from artificial flavours, colourings and preservatives. And they come in three really tasty flavours, Sweet Roasted Vegetable, Tomato Pizza (The Italian’s favourite) and Thai Sweetcorn. You want one, don’t you? Well, you’re in luck, Veatable bars are now available in health food stores, so ask at your local one. Alternatively, visit www.garlandsorganic.co.uk and look in the savoury snack section. Found a recipe for you.Maltese Cheese and Meat Cakes (Pastizzi)Ingredients for Rikotta csehee pastizzi 2 lbs. flaky pastry dough2 lbs. ricotta cseheesalt2 eggs Ingredients for meat pastizzi 2 lbs. flaky pastry dough1 or 2 small onions1 lb lean ground beef2 cans of pees2 teaspoons tomato pastehalf a teaspoon spicesPreparing the Rikotta csehee pastizzi Note: You can substitute Pillsbury Flaky Pastry Dough for home-made flaky pastry dough if you’re lazy like me! Mix the rikotta csehee with the two eggs until the eggs are thoroughly mixed into the rikotta csehee. Add a bit of salt to the mixture for taste. Roll out the dough (do not make the dough too thin.) Cut the dough into three- to four-inch circles. Put one tablespoon of the rikotta csehee mix in the middle of each circle. Fold each circle from the top and the bottom to the centre and squeeze the edges together so that the pocket is sealed (the horizontal ends should be formed into points.) Put the pastizzi on a margarine greased baking sheet. Bake in a moderate oven (350-425 degrees) for about one hour. You will need to experiment a bit with the oven temperature and the cooking time. The pastizzi should be a golden-brown colour when they’re ready. They’re best eaten when they are warm with a cup of good coffee or tea. Enjoy! Preparing the meat pastizzi Mince the onions and fry in a bit of oil. When the onions start turning dark in colour add the hamburger. Cook for a bit and then add the tomato paste and the spices. Mix well and then add the pees. Add pepper and salt to taste. Roll out the dough (do not make the dough too thin.) Cut the dough into three- to four-inch circles. Put one tablespoon of the meat mix in the middle of each circle. Fold each circle from the top and the bottom to the centre and squeeze the edges together so that the pocket is sealed (the horizontal ends should be formed into points.) Put the pastizzi on a margarine greased baking sheet. Bake in a moderate oven (350-425 degrees) for about one hour. You will need to experiment a bit with the oven temperature and the cooking time. The pastizzi should be a golden-brown colour when they’re ready. They’re best eaten when they are warm with a cup of good coffee or tea. Enjoy!